Read by the authors, you’ll receive this product in the mail with an MP3 file loaded on a CD, AND a code to receive a downloadable version from Christianaudio.com. Did you know that the way we deal (or don’t deal) with our kids’ misbehavior shapes their beliefs about themselves, the world, and God? Therefore it’s vital to connect with their hearts–not just their minds–amid the daily behavior battles. 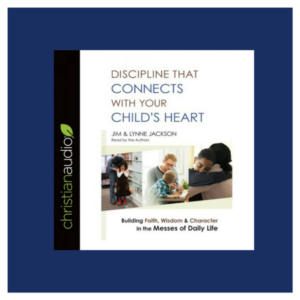 With warmth and grace, Jim and Lynne Jackson, founders of Connected Families, offer four tried-and-true keys to handling any behavioral issues with love, truth, and authority. You will learn practical ways to communicate messages of grace and truth, how to discipline in a way that motivates your child, and how to keep your relationship strong, not antagonistic. Discipline is more than just a short-term attempt to modify your child’s actions–it’s a long-term investment to help them build faith, wisdom, and character for life. When you discover a better path to discipline, you’ll find a more well-behaved–and well-believed–kid. Free shipping on all orders to the United States. Contact us to figure out international shipping costs.